I spend way too much time explaining how much better my artwork looks in real life, but it’s always true. This piece has much richer jewel tones of purple, teal, and green that have all sort of washed out into a vague blueness when converted to rgb. 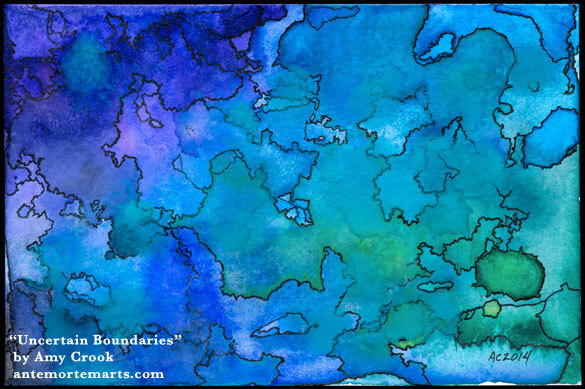 There’s rich layers of color, with some of the boundaries outlined and some erased, and some only vaguely visible. It makes me think of a map of some strange world that has evolved along with the history of the place, borders drawing and redrawing themselves as alien politics shift and change. 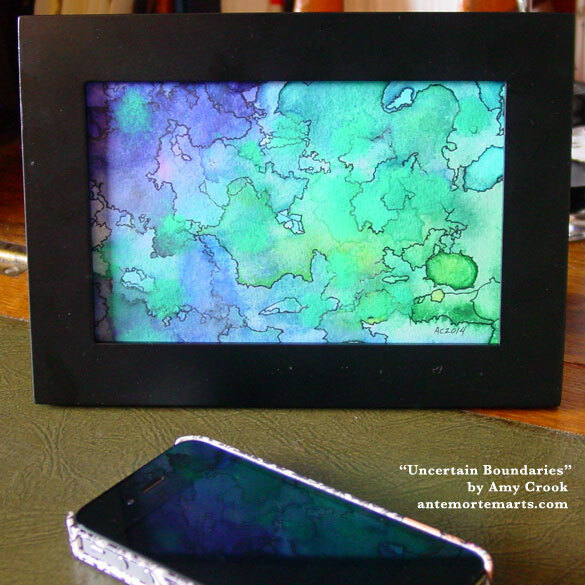 Uncertain Boundaries, 6″x4″ pen & ink and watercolor on Fluid watercolor paper. Above, you can see one of the places where new color obliterates the old, and the boundary lines stutter and fade. 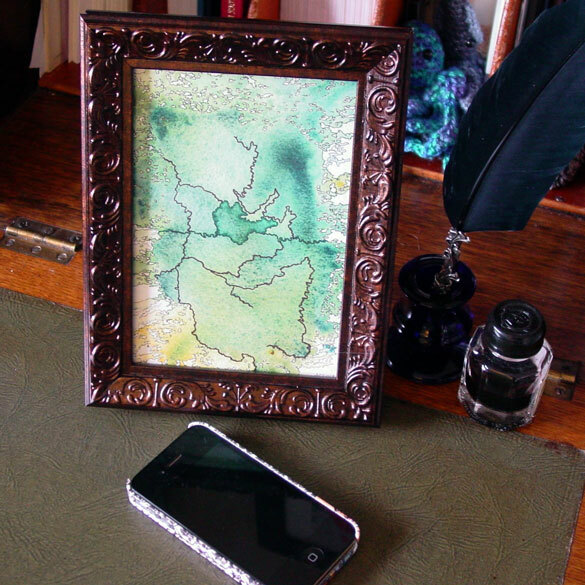 Below, you can see this small piece in a frame, small enough to add its bright color to any number of surprising spaces. I think paintings are hardest to talk about when I really adore them. This one is such an exquisite combination of tiny details and subtle colors created both by deliberate artistic choice and by random chance that I’m ridiculously in love with it. 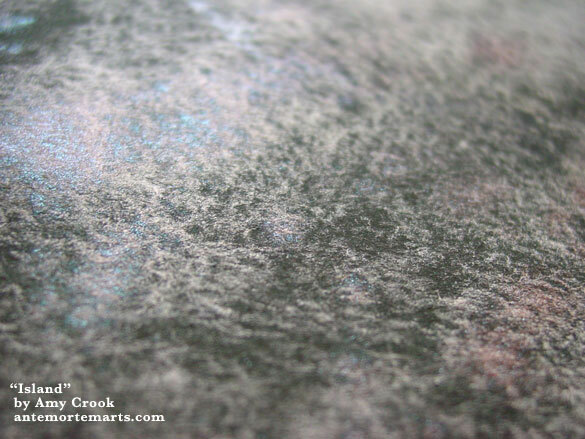 The paper is soft, both in texture and its creamy color, and the paints are all matte shades of real minerals, except for the places where there’s unexpected bursts of red or even sun-catching bits of green iridescence. The shape suggests an island without being any specific one, with its noodling coastlines and the surf creeping up all around it. The green is rich and deep and mysterious, inviting the viewer to look for hidden detail. 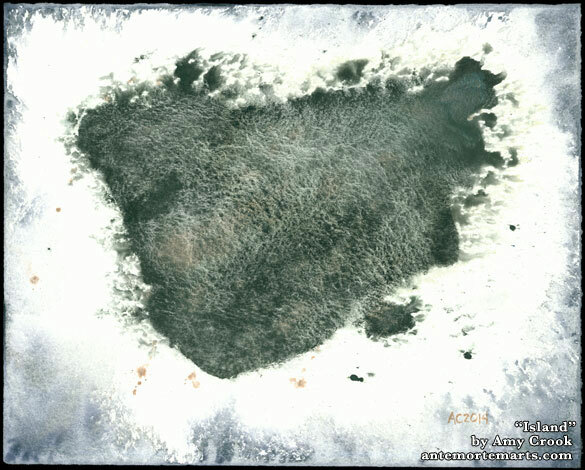 Island, 10″x8″ watercolor and duochrome watercolor on Arches cover white paper. 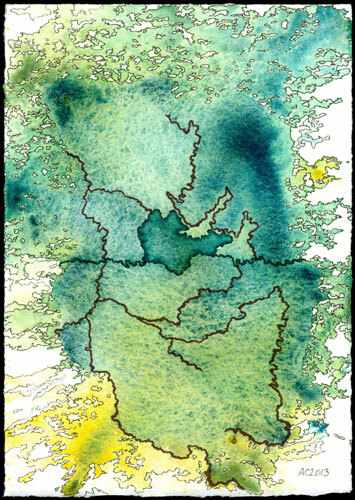 Above, you can see a very close look at some of the detail, in an area with a subtle wash of red hiding under the green, and a tiny patch of shimmering brightness that only shows itself in sunlight, like a lake hidden in deep jungles. Below, the painting’s in a frame, looking even more like some forgotten map. I’m going to post a bit more about some of the pieces in October’s Floating Gallery for the next couple of weeks, starting with this one! If there’s a piece you’re curious about, feel free to ask. 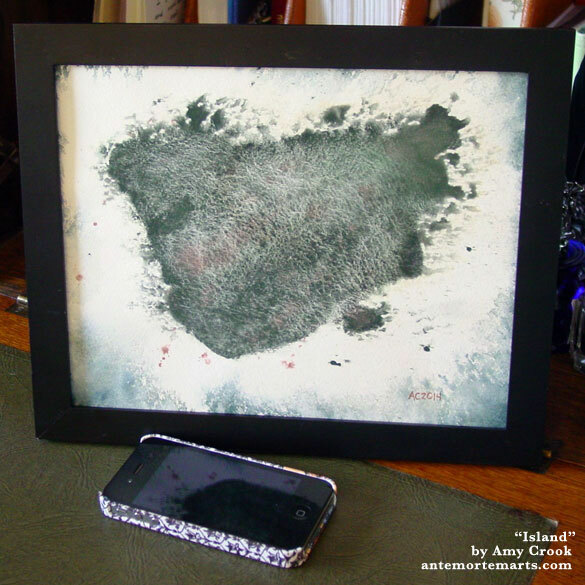 This painting was directly inspired by a patron’s reaction to one of last month’s pieces. You know who you are, and thank you! It’s been a month of being fascinated with maps, for me, so this was a good way to explore that. 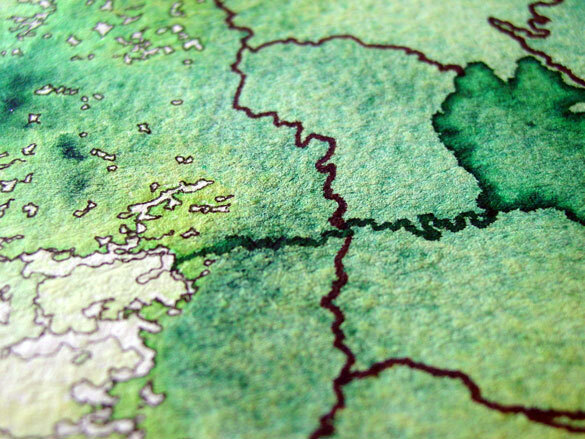 There’s two kinds of pen and ink on here, my teeny tiny Micron pen outlining the fjords and inlets around this strange country, and the thicker Japanese Pilot fountain pens in deep green and dark brown forming the inner details. The line across the middle feels like a river and lake to me, but what if it’s a border, a fault, a plateau or crater? I love the mystery created by the map, making you wonder if the yellow is beaches or deserts or something else. Are those deep green spaces forests or mountains? If the brown aren’t roads, what are they? Are there even people in this undiscovered land, or are you the first to gaze upon it? 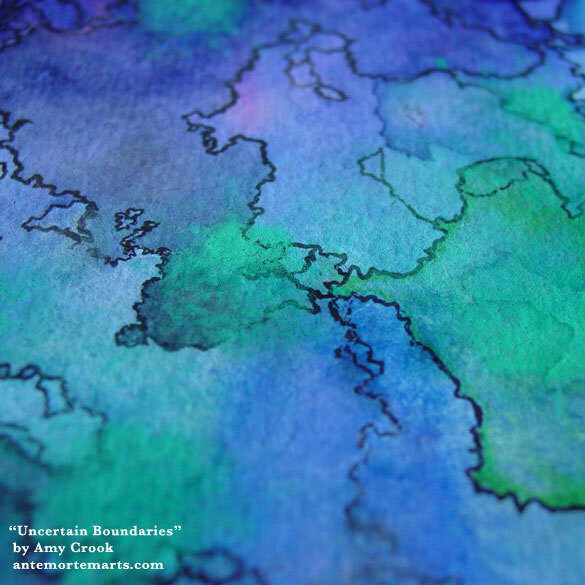 Map to an Undiscovered Country, 5″x7″ pen & ink and watercolor on Arches cover white paper. Above, you can see a close-up of the paper texture interacting with the media to create detail, the tiny hand-drawn borders making strange borders, the thicker lines intersecting and the edge of the shape in the center. Below, you can see it in the frame I got especially for this piece, though of course once it finds a new home I’ll be able to re-purpose this, should the frame not go with it. I’ll end on a note about works in pen and ink. Most colored inks are made with dyes and are less lightfast than the pigments in paint. If you put your art somewhere that gets direct sunlight, it will fade like an old map despite the high quality art paper. So don’t do that. Actually, don’t do that to any art, because even the most lightfast pigments degrade over time. 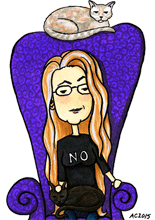 Also, it’s just not nice.